In 1823, a poem entitled A Visit from St. Nicholas was first published anonymously. Four years later it was attributed to Clement Clarke Moore and is most commonly known as ‘Twas the Night Before Christmas. It was one of the first times that impressions and traits of St. Nickolas were written in a way that allowed the reader to visualize what ‘Santa Claus’ looked like. The poem has become synonymous with the Christmas season and has been immortalized in song, spoken word, comics, literature, and film. In more recent years, the poem has been attributed to Henry Livingston by some scholars. The authorship of this poem continues to be a source of debate, although a recent analysis is pointing to Livingston as the likely true author. Regardless, I have vivid memories of my father reading the poem on Christmas Eve every year while I was growing up with my siblings in New York. 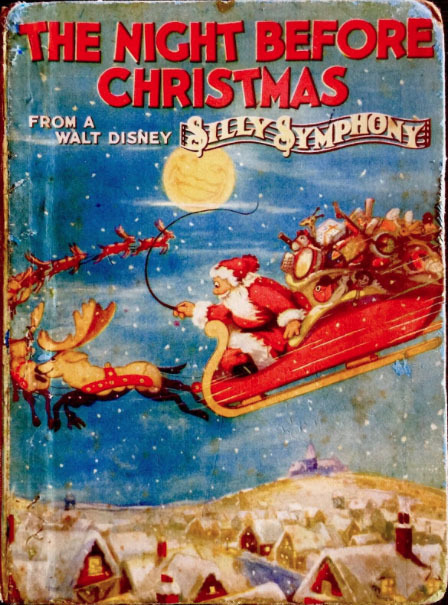 In December of 1933, The Walt Disney Studios released its own version of the poem with its fortieth animated Silly Symphony cartoon, The Night Before Christmas. The short was directed by Wilfred Jackson, who later directed on Snow White, Pinocchio, Fantasia, Dumbo, and many others. Jackson was a prolific animator who started at Disney working on the Mickey Mouse short Steamboat Willie. He moved up the ranks quickly going on to direct thirty-five shorts including three Academy Award winners—The Tortoise and the Hare, The Country Cousin, and The Old Mill. 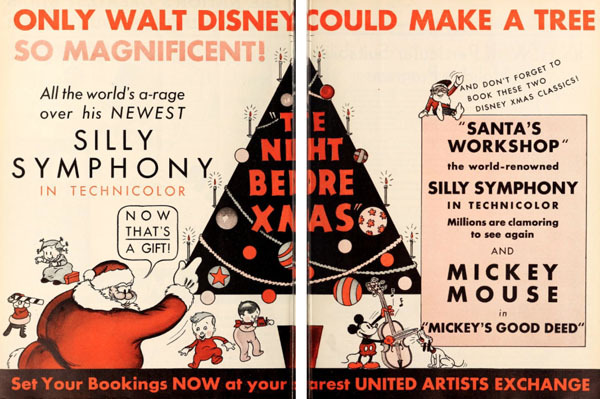 The Night Before Christmas was made as a sequel—a continuation, of the previous year’s popular Silly Symphony Santa’s Workshop (1932) also directed by Jackson. Both shorts use the same Santa Claus character design. 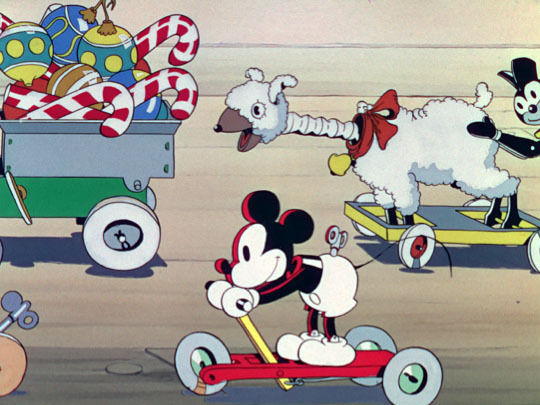 In The Night Before Christmas, Santa is delivering the toys that were made by his elves in Santa’s Workshop, including a mechanical Mickey Mouse wind-up toy that motors by with other dolls and toys after leaving Santa’s sack for the base of the Christmas tree. An example of a character from another, unrelated property making a “cameo” appearance, which can also be found in many other Disney animated films. The animation of this scene is attributed to Ugo D’Orsi. He was one of the founding artists of the first dedicated special effects department at the Disney Studios. The Night Before Christmas features animation by many of Disney’s legendary animators including Art Babbit, Les Clark, Hamilton (Ham) Luske, Norm Ferguson, and Fred Moore among others. 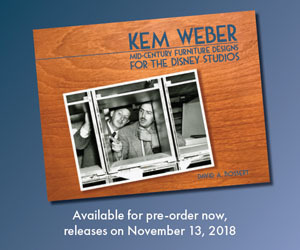 Babbit helped to develop Goofy; Clark became one of Disney’s legendary Nine Old Men; Luske was a sequence director on Pinocchio, Fantasia, Cinderella, Peter Pan and many others; Ferguson is noted for helping to create Pluto; and Moore was known for his appealing drawings of woman and for his beautiful redesign of Mickey Mouse in 1938 for The Sorcerer’s Apprentice. All of these animators and directors cut their artistic chops working on the early short films, which were the training grounds leading to the first fully animated feature film, Snow White and the Seven Dwarfs. Depending on the source referenced, either actor/singer Donald Novis or singer Kenny Baker were cast for the narrator in which part of the Clement Clark Moore poem is sung as a ballad—a spoken word-like singing style set to music. When two or more individuals are referenced on different documents, I want to mention both simply because there is a conflict in the paperwork. This is similar to my previous article on The Old Mill, which had documents showing two different people being credited for directing, Wilfred Jackson and Graham Heid. It was clearer cut since Wilfred Jackson was the named as director for the short on an Academy Award program. In this case it is different because there is no definitive indication that I could find, Novis and Baker are credited in different documentation. Both Baker and Novis were popular singers during that time period, but Novis is listed in several databases as singing not only on The Night Before Christmas but also Bambi, and Lady and the Tramp. That shows a solid Disney connection. He also returned to Disney in 1955 when he co-created, with Wally Boag, the Golden Horseshoe Revue at Disneyland’s Frontierland. He went on to star in that show for nine years before retiring in 1964. This film is not without controversy. 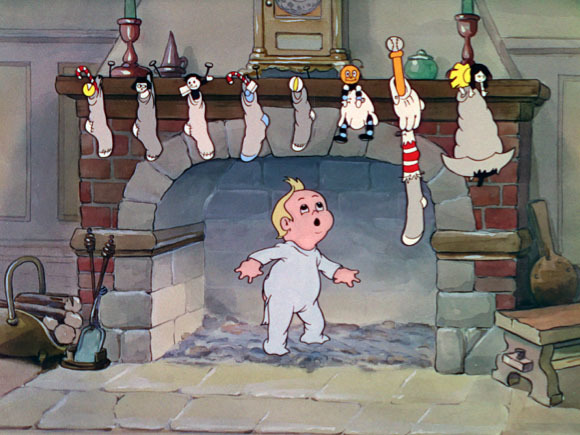 Towards the end of the short, after Santa Claus has left going up the chimney, a small boy named Junior runs into the fireplace hearth and looks up. After a beat, he is hit in the face with a pile of soot and then looks at camera with a racially insensitive blackface. In later years, the offending scene was edited out and replaced with footage of Santa flying away. But in 2014, the scene was digitally modified to reflect Junior still being hit with the soot but showing more natural looking dirty blotches on his face. I felt that this was a better solution then editing in footage from another cartoon. It maintained a more original version of the short with only a minor modification, which allowed for the short to be accessible to all, even though the original uncut version is available on YouTube. As societal norms change, it is appropriate to make these types of adjustments rather than placing such shorts on restricted lists and locking them away. Changing the offensive scene to an acceptable version doesn’t distract from but rather adds to the overall joyous tone for the film, which is in keeping with the holiday spirit of inclusion and goodwill to all. I hope that you will take a moment to watch The Night Before Christmas and read the original poem during this holiday season. Both are easily accessible online. When watching this short, it is worth noting that story development took approximately three months and it was animated in about six weeks. It’s amazing what you can get done in animation in a streamlined organization. Wishing you all a very happy and healthy Holiday season. Was left cringing in my seat when I saw this “sanatised” version on the big screen at the BFI a few years ago with the repremiere of the Oswald short “Sleigh Bells”. I understand the intent to make a version more accessible to a modern general audience (not that I’ve seen this version turn up anywhere beyond the screening, har de har) but it’s a shame the real uncut version (with the oft-forgotten Amos and Andy toy sequence) will likely only remain exclusive to those lucky sobs who have the replacement disc of the More Silly Symphonies Treasures DVD. Is it really so important for the cartoon that, above all, is meant to invoke a sense of wonder and fun also include gross racial stereotypes and humor mocking minorities? Is it’s removal so that these cartoons can still be shown to a new generation of children something to cringe over? I’ll honestly never understand this attitude, it’s not like they’re destroying prints of these cartoons, they are just making more palatable versions for a modern audience. Lil Junior looked up at the chimney flue and got a shot of soot and ashes in his face and made him look “Blackfaced” and later when he received a Scottie from Santa, the Scottie licks Junior’s face remove the ashes and soot from Junior’s face. That scene was “butchered” in its first reshowing and in the second reshowing they digitally removed the offending scene. 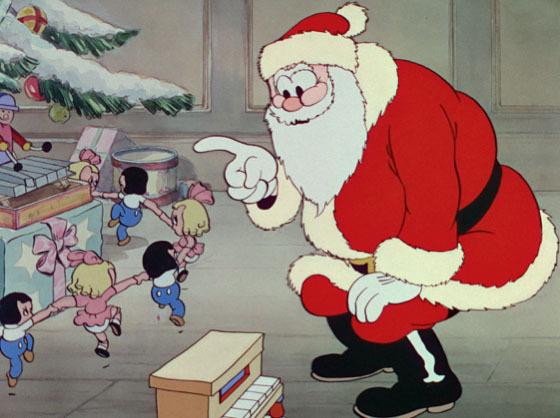 Sadly cartoons like the Night Before Christmas and other vintage cartoons need to be restored in its full glory and not P.C.ed to death by cutting out scene that might be offensive to others. The “Blackface” scene was not removed in the most recent restoration. It was digitally altered so it was no longer offensive. I think that is appropriate especially for a company that is all about family, inclusion, and embracing a diverse world audience. That said, the original is still intact and is readily available on YouTube. The fully uncut version of this toon doesn’t actually appear to be “readily available” on YouTube at all, legitimately or otherwise. I wonder why they don’t just LEAVE the sh-t aLONE!!?? Editing like this is just a first step on a slippery slope. Where does this stop? What art is safe? Somebody is always offended by something, pretty soon everything will have to be changed or deleted because somebody says they are offended. The real rarity would be the original 1933 ending, in which Junior’s gift was a chamber pot. The more heartwarming ending, with the little dog that licks the soot off his face, was substituted for the film’s first reissue. I hate that so many people in the classic animation fan community view the racist caricatures and stereotype based humor in cartoons like this as anything other than an embarrassment and a blotch on the history of the medium. Of course they’re going to take black face jokes out of cartoons intended to be shown to a wide audience. The original is well archived for historians and die hards. The original is well archived for historians and die hards. *IS* it though? At the moment, there is no readily available source for any of the Disney cartoons in high-definition. A DailyMotion link is not sufficient. I’ve long been in favor of the racially insensitive cartoons having appropriate exposure—as in, being available in collectors’ sets, not kiddie-themed TV broadcasts and videos—but you have to admit that BFI screening a censored cartoon at a show that’s supposed to be promoting restoration and preservation is a little embarrassing. The original version of The Night Before Christmas , which includes the Amos & Andy scene, the chamber pot gift, and the Junior blackface, is preserved in the studio film library. Obviously Grilled I agree 100% with everything that you Obviously Sincerely articulated in your two posts. Sorry, will have to side with Thad on this one, he’s expressed more articulately that I probably ever could my main beef with the implications there is only 1 readily available high-def censored master of this short and “Santa’s Workshop” publicly available. If the BFI or Disney had advertised this in some form beforehand during the screening, I would have probably have been (begrudgingly) fine with it. And yes, the original may be “well archived” in the glorious Disney vault but can “historians and die hards” actually access it? Call me spoiled, but a long-OOP DVD (and illegal DailyMotion rips of said DVD) doesn’t really cut it nowadays. If the original chamber pot end gag truly exists, I don’t believe it’s ever been released “officially” on any form of home video as far as I am aware.